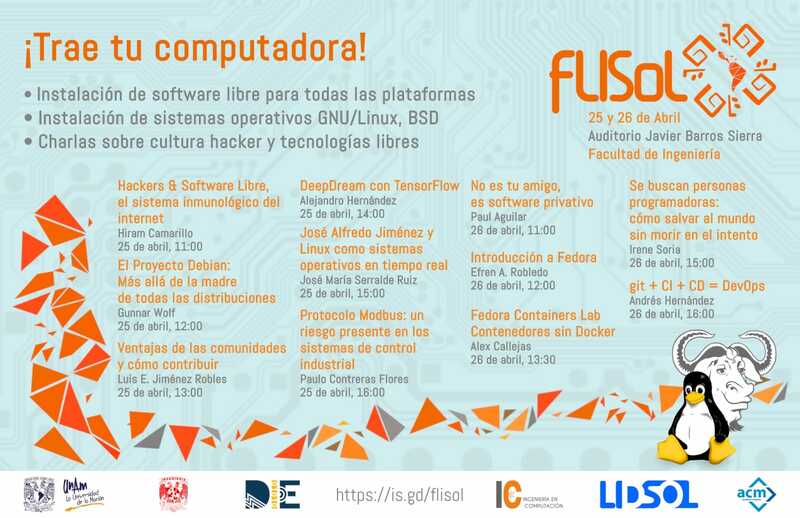 After several years of absence, LIDSOL (Laboratorio de Investigación y Desarrollo de Software Libre) is once again organizing a FLISOL! And what is a FLISOL? 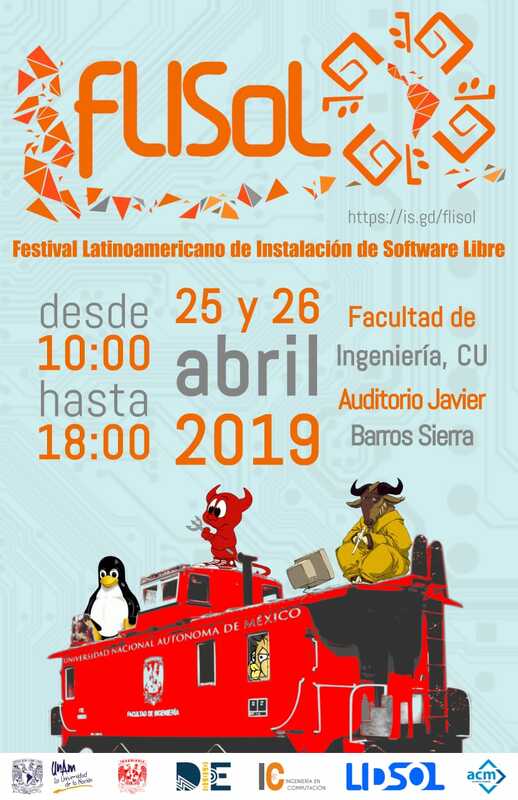 It is the Festival Latinoamericano de Investigación y Desarrollo de Software Libre — An activity that started off as an installfest, but went on to become a full set of conferences. Set of conferences? Yes, because FLISOL happens more-or-less simultaneously (the official date is the last Saturday of April, but there is tolerance for it to happen up to a couple of weeks around it) all over Latin America. This year, FLISOL will be held at different cities in Germany, Argentina, Bolivia, Brazil, Chile, Colombia, Costa Rica, Cuba, Ecuador, Spain, El Salvador, Guatemala, Honduras, México, Nicaragua, Panamá, Paraguay, Perú, Rep. Dominicana, Uruguay and Venezuela. 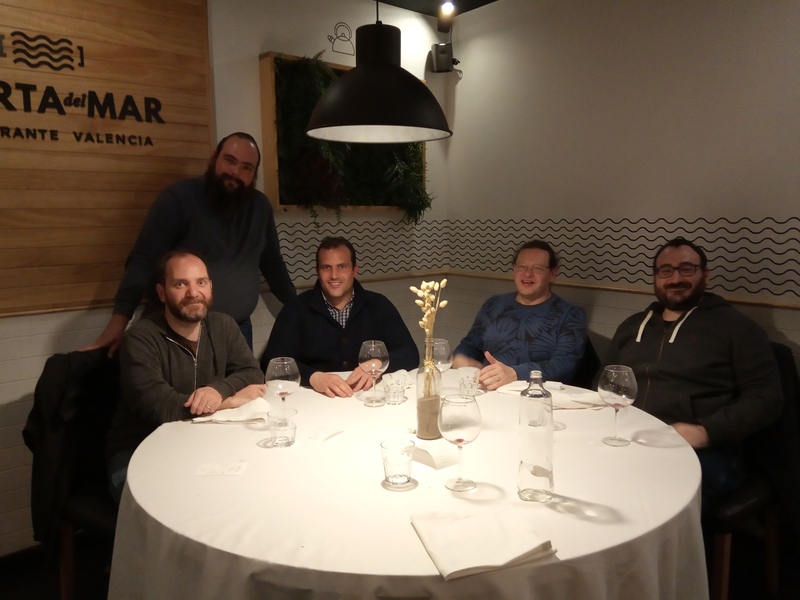 Today, we had a little get-together of DDs in València, Spain, with some other DDs. Most of us were here to attend the Internet Freedom Festival (IFF), plus Héctor and Filippo, who are locals. We missed some DDs (because in a 2500+ people gathering... Well, you cannot ever find everybody you are looking for!) so, sorry guys for not having you attend! Sadly, we have no further report than having enjoyed a very nice dinner. No bugs were closed, no policy was discussed, no GRs were drafted, no cabals were hatched. I have been busy as hell this year. I might have grabbed a bigger bite than what I can swallow – In many fronts! Anyway, sitting at an airport, at least I have time to spew some random blurbs to The Planet and beyond! We all feared when no candidates showed up at the first call for DPL. But things sorted out themselves as they tend to (and as we all knew that would happen ;-) ), and we have four top-notch DPL candidates. It's getting tough to sort through their platforms and their answers in the lists; the old-timers among us have the additional advantage of knowing who they are and probably having worked closely with some of them. I am still drafting my Condorcet ballot. It won't be an easy task to completely rank them! For personal and selfish reasons, I am very, very happy to have a reason to go back to Israel after over two decades. 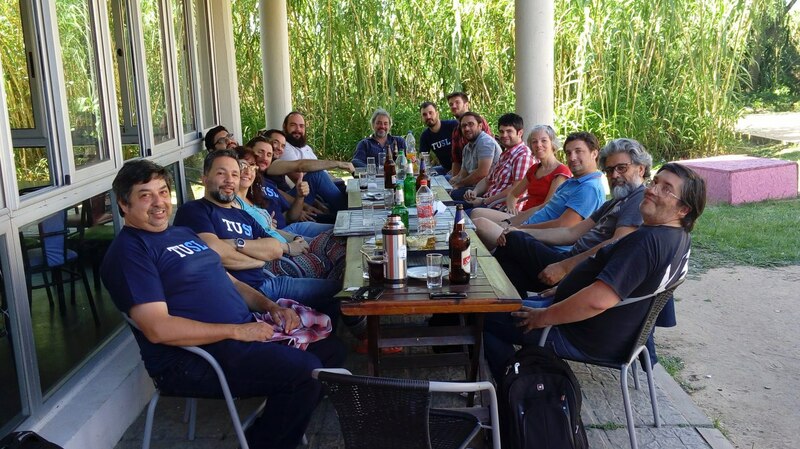 Of course, as everybody would expect, there is a bothering level of noise that's not going to quiet down until probably late August 2020... DebConf has often taken controversial turns. Israel is not the toughest one, even if it seems so to some readers. And... Well, to those that want to complain about it — Please do understand that the DebConf Committee is not a politically-acting body. Two bid submissions were presented fully, and the Israeli one was chosen because its local team is stronger. That is probably the best, most important criteria for this conference to be successful. No, it's not like we are betraying anything — It's just the objective best bidding we got from completely volunteer teams. What are you waiting for? Register! Submit a talk! Pack up and get your ticket for Brazil! I'd better get moving, the plane might be getting some ideas about taking off. Some days ago I read a piece of news that shocked me at different levels: Three blocks away from my home, and after being "unclearly" denounced for harassing a woman, a guy was beaten to death. Several sources for this: El Diario MX: Por acosar a mujer lo golpean hasta la muerte; El Siglo de Torreón: Asesinan a hombre por presuntamente acosar a mujer en Coyoacán; Zócalo: Matan a hombre en Coyoacán; Milenio: Por presuntamente acosar a mujer, golpean y matan a hombre en CU. Of course, when anybody cries for help, it should be our natural response (everybody's!) to rush and try to help. However, stopping an aggression is a far cry from taking justice in our own hands and killing a guy. Mob justice is usually associated with peri-urban or rural areas, with higher socioeconomic margination and less faith in authority. Usually, lynching mobs generate a very bad and persistent name to wherever said acts of brutality happened. While I don't want to say we are better than..., it shocks me even more to have found this kind of brutality in the midst of the Universitary neighbourhood, at a very busy pedestrian street, at all times (this happened somewhat after noon on Thursday) full of teachers and students. Not only that. The guy who was attacked was allegedly a homeless guy, in his mid 20s. Some reports say that after the beating took place, he was still alive, but when the emergency services arrived (30 minutes later!) he had died. We are literally less than 200m away from Facultad de Medicina, and hundreds of students and teachers walk there. Was nobody able to help? Did nobody feel the urge to help? Also... While there is not much information regarding this attack, I'm quite amazed almost no important local (or even national!) media have picked this up. We are less than 1Km away from the central offices of Grupo Imágen! This is no small issue. Remember the terrible circus raised around the Tláhuac lynches in ~2005 (and how Tláhuac still carries that memory almost 15 years later)? What is the difference here? No attack on women should be tolerated quietly. But no lynchmob should be given a blind eye to. This deeply worries and saddens me. Debian on the Raspberryscape: Great news! I already mentioned here having adopted and updated the Raspberry Pi 3 Debian Buster Unofficial Preview image generation project. As you might know, the hardware differences between the three families are quite deep — The original Raspberry Pi (models A and B), as well as the Zero and Zero W, are ARMv6 (which, in Debian-speak, belong to the armel architecture, a.k.a. EABI / Embedded ABI). Raspberry Pi 2 is an ARMv7 (so, we call it armhf or ARM hard-float, as it does support floating point instructions). Finally, the Raspberry Pi 3 is an ARMv8-A (in Debian it corresponds to the ARM64 architecture). Thanks (again!) 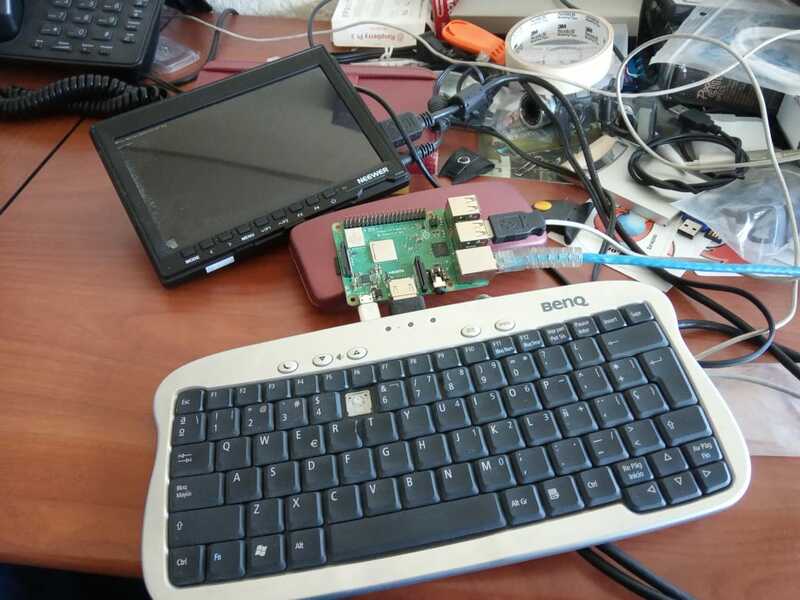 to Romain Perier, I got word that the "lesser" Raspberries can be made to boot from Debian proper, after they are initialized with this dirty, ugly firmware! I rebuilt the project, targeting armhf instead of arm64. 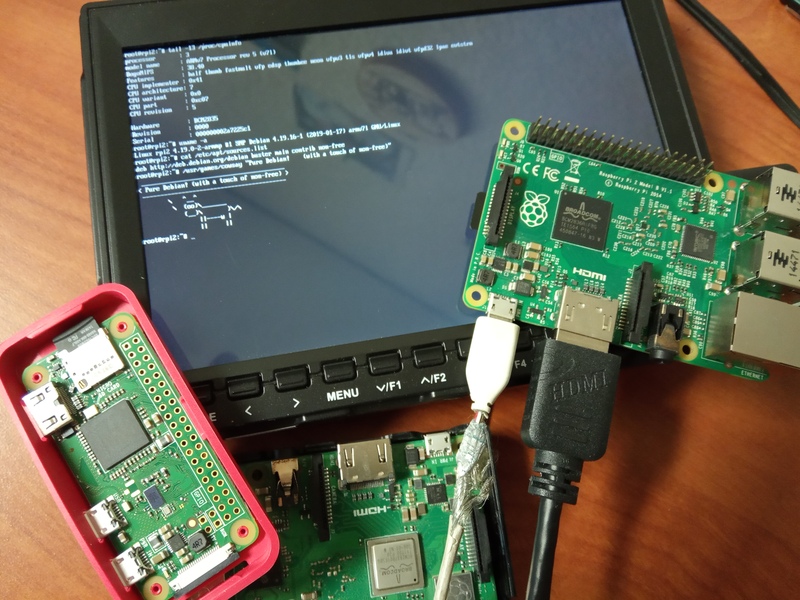 Dropped an extra devicetree blob on the image, to help Linux understand what is connected to the RPI2. Flashed it to my so-far-trusty SD. And... Behold! On the photo above, you can appreciate the Raspberry Pi 2 booting straight Debian, no Raspbian required! As for the little guy, the Zero that sits atop them, I only have to upload a new version of raspberry3-firmware built also for armel. I will add to it the needed devicetree files. I have to check with the release-team members if it would be possible to rename the package to simply raspberry-firmware (as it's no longer v3-specific). Why is this relevant? Well, the Raspberry Pi is by far the most popular ARM machine ever. It is a board people love playing with. It is the base for many, many, many projects. And now, finally, it can run with straight Debian! And, of course, if you don't trust me providing clean images, you can prepare them by yourself, trusting the same distribution you have come to trust and love over the years. I just adopted Lars' vmdb2. Of course, I was eager to build and upload my first version and... Hit a FTBFS bug due to missing dependencies... Bummer! So I went to my good ol' cowbuilder (package cowdancer)to fix whatever needed fixing. But it took long! Do note that my /var/cache/pbuilder/base.cow was already set up and updated. But... What if I take the spinning rust out of the equation? Close to ¹/₁₆th of the running time — Even including the copy of the base.cow! OK, I cheated a bit before the rsync, as my cache was already warm... But still, convenient! As I mentioned two months ago, I adopted the Debian Raspberry 3 build scripts, and am now building a clean Buster (Debian Testing) unofficial preview image. And there are some good news to tell! 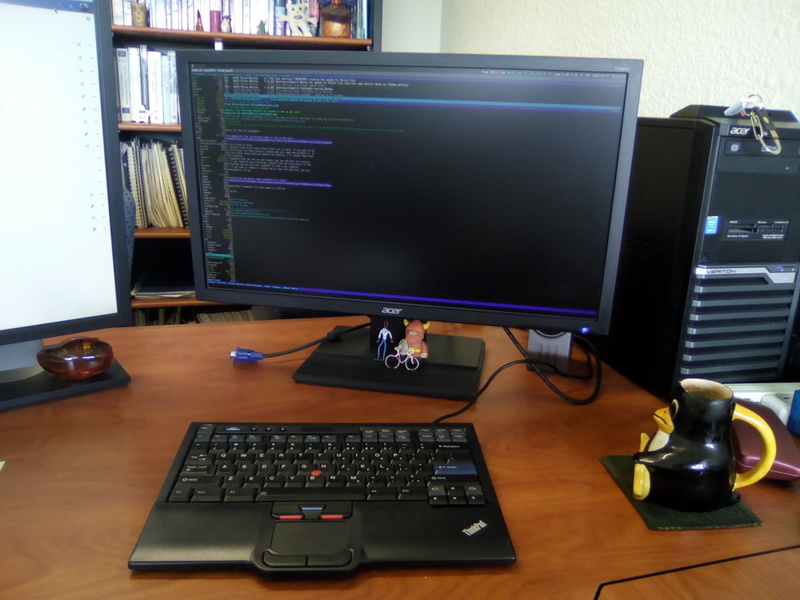 I did quite a bit of work together with Romain Perier, a soon-to-become Debian Maintainer, and he helped get the needed changes in the main Debian kernel, thanks to which we now finally have working wireless support! Romain also told me he did some tests, building an image very much like this one, but built for armel instead of armhf, and apparently it works correctly on a Raspberry Pi Zero. That means that, if we do a small amount of changes (and tests, of course), we will be able to provide straight Debian images to boot unmodified on all of the Raspberry lineup! Back to the teaching business! Sometimes, life is measured in semesters. This is the 13th semester I teach. I can no longer feel a newbie. I am still just a part-time teacher, but I know it's an activity I very much enjoy, and I hope I can at some point manage it to become full-time activity. After three months of slumber (three weeks of which were the hard vacations, but then there's the intersemestral active period), our university came back to life and full occupation. 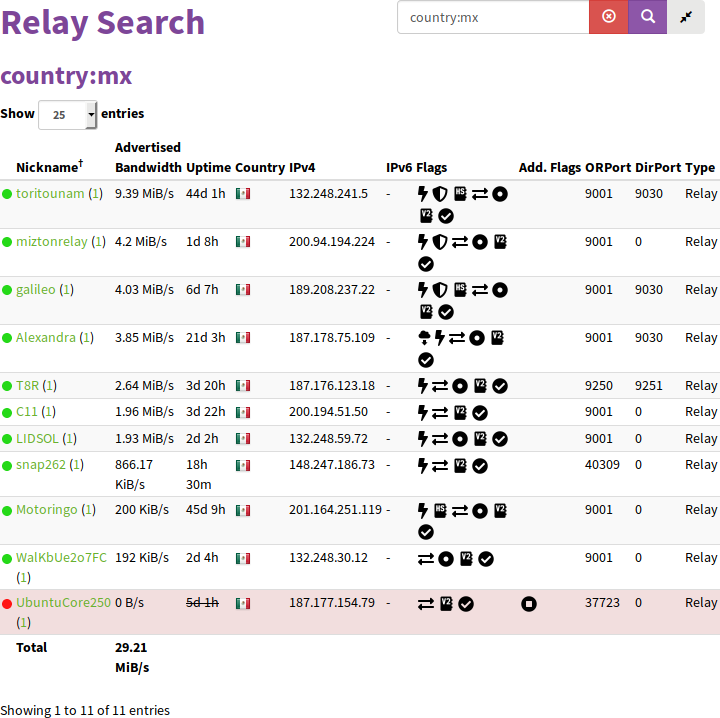 Finally, a sensible increase in participation for Tor in Mexico! /Known fact: Latin America's share of participation in different aspects of the free software movement is very low. There are many hypotheses for this, but all in all, it's mainly economics related: Only a tiny minority of us in this geographic region can spare the time, energy and money needed to donate part of our work and life to a project, no matter how much we agree with it. Of course, this cannot explain it wholly; there are many issues that further contribute with this low participation. Free software development is mostly carried out in English (much more so even than programming in general, although basically any programing language "reeks" of English). One of the issues we have been pushing for, with marginal success rate until very recently, is to get more people involved running Tor relays or, if possible, exit nodes. Of course, when I asked officially for permission to set up an exit node at the university (I want to do things the right way), I was right away slammed and denied. But... Patience, time, hardware donation by Derechos Digitales, and some determination have led us to the fact that... 18 months ago, we only had one or two active Tor relays. Now, the reality is finally changing! Thanks to many individuals willing to donate their time and resources, we currently have eleven relays (eight of them which I can recognize by name and thank their respective owners — The linked page will probably give different results, as it varies over time). And, very notably: I have to recognize and thank our friends at Red en Defensa de los Derechos Digitales (R3D), as they have set up our –so far– only exit node (via the Axtel ISP). Wow! Ten relays, mind you, is still a tiny contribution. 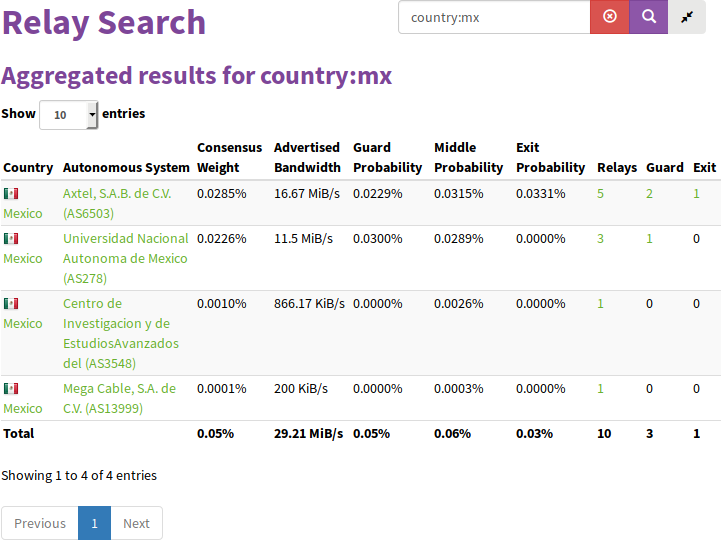 Due to the bandwidth we are currently able to offer (and many many many other factors I cannot go into details, as I don't even know them all), Mexico as a country is currently providing approximately 0.05% (that is, one out of each 2000) Tor connections as a guard (entry) node, a slightly higher amount as a middle node, and a slightly lower amount as an exit node. But it is steadily increasing, and that's great! 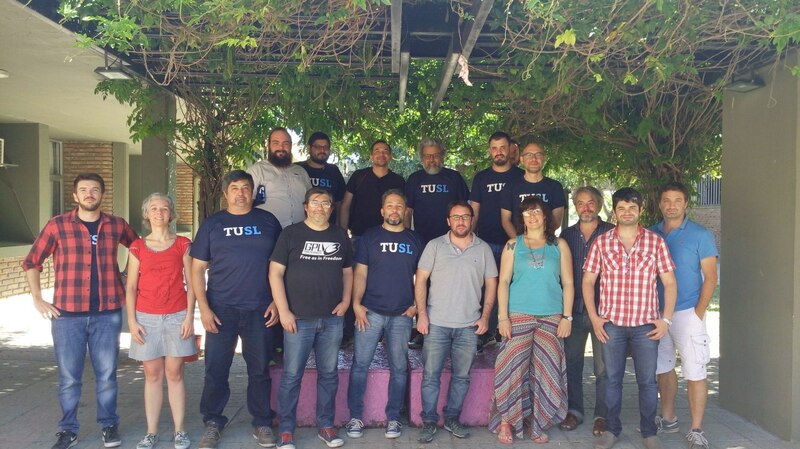 Tecnicatura Universitaria en Software Libre: First bunch of graduates! December starts for our family in Argentina, and in our second day here, I was invited to Facultad de Ingeniería y Ciencias Hídricas (FICH) of Universidad Nacional del Litoral (UNL). FICH-UNL has a short (3 year), distance-learning career called Tecnicatura Universitaria en Software Libre (TUSL). This career opened in 2015, and today we had the graduation exams for three of its students — It's no small feat for a recently created career to start graduating their first bunch! And we had one for each of TUSL's "exit tracks" (Administration, development and education). Back in June, Michael Stapelberg asked for somebody interested in adopting the unofficial Debian image for the Raspberry Pi 3 family. It didn't take me long to raise my hand. What did take me long is to actually do it. I have adopted Raspberry3 image spec repository, with the recipes to build the image using Lars' great vmdb2, as well as the raspi3-firmware non-free Debian package. There is a new, updated preview image! You can look at the instructions at the Debian Wiki page on RaspberryPi3. Or you can just jump to the downloads, at my people.debian.org — xzipped image (388MB, unzips to 1.5GB, and resizes to the capacity of your boot SD at first boot), verification sha256sum, and PGP-signed verification sha256sum. No wireless support. Due to a bug in Linux kenel 4.18, wlan0 support is broken. It is reported, and we expect it to be fixed in the next kernel upload. Other than that, what we have is a very minimal Debian system, ready for installing software! At some point in the future, I plan to add build profiles for some common configurations. But lets go a step at a time. I have been honored to be invited as a co-chair (together with Vasilis Ververis and Mario Isaakidis) for a Special Track called «Topics on Internet Censorship and Surveillance» (TICS), at the The Eighteenth International Conference on Networks, which will be held in Valencia, Spain, 2019.03.24–2019.03.28, and organized under IARIA's name and umbrella. I am reproducing here the Call for Papers. Please do note that if you are interested in participating, the relevant dates are those publicized for the Special Track (submission by 2019.01.29; notification by 2019.02.18; registration and camera-ready by 2019.02.27), not those on ICN's site. Over the past years there has been a greater demand for online censorship and surveillance, as an understandable reaction against hate speech, copyright violations, and other cases related to citizen compliance with civil laws and regulations by national authorities. Unfortunately, this is often accompanied by a tendency of extensively censoring online content and massively spying on citizens actions. Numerous whistleblower revelations, leaks from classified documents, and a vast amount of information released by activists, researchers and journalists, reveal evidence of government-sponsored infrastructure that either goes beyond the requirements and scope of the law, or operates without any effective regulations in place. In addition, this infrastructure often supports the interests of big private corporations, such as the companies that enforce online copyright control. TICS is a special track the area of Internet censorship, surveillance and other adversarial burdens to technology that bring in danger; to a greater extent the safety (physical security and privacy) of its users. Please help me share this invitation with possible interested people! Privacy and Anonymity Colloquium • Activity program announced! So, even though changes are still prone to happen, I am happy to announce the activity program for the colloquium! I know some people will ask, so — We don't have the infrastructure to commit to having a video feed from it. We will, though, record the presentations on video, and I have the committment to the university to produce a book from it within a year time. So, at some point in the future, I will be able to give you a full copy of the topics we will discuss! 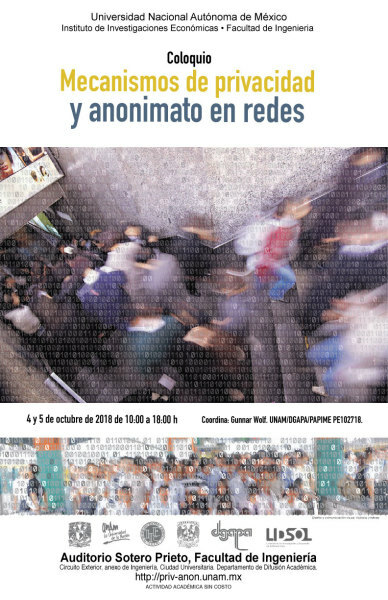 But, if you are in Mexico City, no excuses: You shall come to the colloquium! So it is settled: Thinkpad FTW! So, I hope this will help me go back to being more productive! I ended up buying a Lenovo Thinkpad SK-8845 keyboard. As it was mentioned by Martin, jelly and Marcos on my previous blog post (hey! This is one of the rare ocasions where I must say Thanks Lazyweb! ), it is not a new model, but it seems to be in mint shape... Plus, I got it for only MX$745 (that is, ≈US$37), shipped to my office and all! My experiences so far? 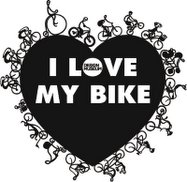 Mostly positive. Yes, I would prefer the trackpad to be a bit larger (it is approx 6×4cm). Most noticeably, I spent some time getting my setup working, as I had to remap my keys — I rely quite a bit on the Super and Multi keys (oh, are you not a Unix person? Super is Mod4, usually located at the Windows keys; I reconfigured the Menu key to be Multi or Compose, to be able to input §ṫℝ∀ℕĠ̣∃ symbols, even some useful ones from time to time). This keyboard has no Windows or Menu keys, so I was playing a bit with how my fingers accept Super being at CapsLock and Multi being and ScrollLock... Lets see! 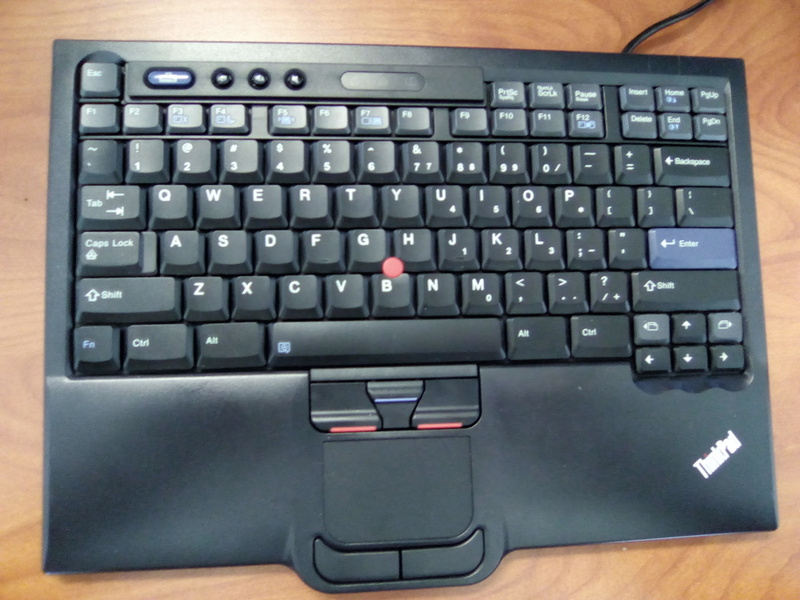 Also, I am super-happy with my laptop's keyboard (Thinkpad as well, X230), and I thought not having different mental models for laptop and office keyboards would be a win... But this is the seven-row Thinkpad model, and the X230 has the six-row one. Not much changes to the finger memory, but I've found myself missing the Esc key (one row higher) and PgUp/PgDn (in the upper corner instead of around the cursor keys). Strangest, I initially thought I would be able to remap Super and Multi to the two keys where I expected PgUp and PgDn to be (what are their names? ), but... Looking at the keycodes they send, it is just not possible — They are hardwired to send Alt + → or Alt + ←. Will come handy, I guess, and I will get used to them. But they are quite odd, I think. With all the people that complained loudly when Lenovo abandoned the seven-row in favor of the six-row layout... I guess I'm about to discover something good..? Our university, among the largest in the world and among the most important in Latin America, had an unexpected and traumatic event last September 3rd: A group of students from one of the high schools our university operates, peacefully protesting, demanding mostly proper study conditions and better security for their area, were violently attacked by a large, organized group. Things are still very much in flux, and we have yet to see what this really meant, and what are its consequences. But in the meantime, I cannot but take as mine the following words, by Comité Cerezo. I am sorry for not translating into English, interested people will be able to do so using automated services or human talent. 1. Repudiamos con la misma fuerza la actitud omisa e indolente que en los distintos videos e imágenes se observa por parte del cuerpo Auxilio UNAM ante los hechos de violencia. Incluso nos preguntamos por qué elementos de esta corporación de seguridad se acercaron a los grupos de jóvenes que atacaban a los manifestantes e incluso los saludaron de mano en lugar de impedir que agredieran a los estudiantes. 2. Repudiamos el hecho de que, a priori, en algunos comunicados de las autoridades se afirmara que los agresores eran personas ajenas a la comunidad académica. De acuerdo a informaciones que circulan en redes sociales (y que por supuesto deben ser verificadas) algunos de los agresores forman parte de la comunidad estudiantil y de grupos que operan, al menos en CCH Azcapotzalco, CCH Naucalpan y CCH Vallejo. La condena a la violencia y la afirmación pronta de que los agresores no son integrantes de la comunidad es un acto incongruente con la promesa de investigar los hechos. En el mismo sentido afirmar que los hechos que se vivieron buscan enturbiar el ambiente sin tener una investigación clara de qué grupo operó, sin tener claridad en la cadena de mando y en la implicación de algunas autoridades no abona en nada a la resolución del conflicto. 3. Manifestamos nuestro extrañamiento por el hecho de que pese a que en los pronunciamientos de las autoridades se afirma que están abiertas al diálogo, no se haya mencionado que las demandas por las que los estudiantes se manifestaban en Rectoría serán atendidas y de qué modo. a) Expliquen a la comunidad universitaria por qué el cuerpo de Auxilio UNAM, como en otros casos ya públicos, no detuvo a los agresores ni intentó contenerlos. Es necesario también que expliquen a la comunidad por qué un integrante de Auxilio UNAM afirmó ante un medio de comunicación en un video que “tenían órdenes de arriba de no actuar”. La comunidad universitaria exige claridad en la rendición de cuentas de cómo y por qué se operó de ese modo. Asimismo, deben aclarar quiénes eran los funcionarios que en los distintos videos están cerca o saludan al grupo de agresores y por qué en lugar de impedir los hechos se limitaron a mirar y en algunos casos a interactuar con estos grupos. b) Que la investigación de los hechos así como sus avances se hagan públicos. Esa investigación implica una gran exhaustividad y claridad. Las autoridades deben explicar a todos ¿Quiénes eran los jóvenes, y muchos no tan jóvenes, agresores? ¿A qué grupo o grupos pertenecen? ¿Cómo se trasladaron a la Rectoría? Pero no basta con la aclaración de los hechos que componen el ataque, es necesario también que se investigue quién ordenó u orquestó tal ataque, la cadena de omisiones que lo hicieron posible así como la investigación de las autoridades involucradas o no en tales hechos, de tal manera que no sólo se investigue a los ejecutores de las agresiones sino a la cadena completa de mando que las planeó u ordenó. c) Que se atienda y brinde todo el apoyo necesario para los alumnos atacados, sus familiares y amigos de manera integral y apoyándolos en todas las acciones que ellos necesiten no sólo en su atención médica y psicológica, sino en el acompañamiento jurídico en caso de que quieran proceder contra los agresores. d) Que de inmediato se nombre un representante de Rectoría que se haga responsable de recibir a una comisión que presente el pliego petitorio o las demandas de los estudiantes y que de inmediato rinda cuentas de la manera en que se atenderán esas demandas. De lo contrario decir que el diálogo y la apertura es la solución sin establecer mecanismos concretos y claros de cómo se atenderán las demandas de los estudiantes es sólo una declaración que no alcanza a resolver el problema. e) Vigilar que bajo ninguna circunstancia, los estudiantes que han decidido parar actividades y aquellos que están marchando y/o concentrándose en la explanada de Rectoría, como ejercicios del derecho humano a la protesta por los graves hechos ocurridos el 3 de septiembre en la Rectoría, sean intimidados, molestados, amenazados o agredidos por grupos porriles (ajenos o no a la comunidad universitaria) ni por autoridades o integrantes de la misma comunidad.